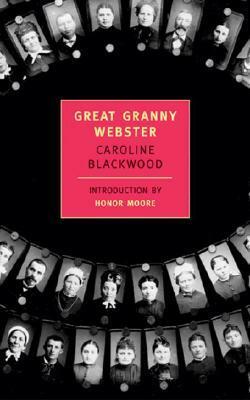 Great Granny Webster by British author Caroline Blackwood came recommended by commenter, Leroy. The novel also had the advantage of being from New York Review Books, and since I’ve had such good luck with their titles, I decided to read it. This is a largely autobiographical tale written by Blackwood, the heiress to the Guinness fortune. The introduction from Honor Moore notes that the book was a finalist for the Booker, but that it did not win thanks to “the decisive vote cast from Philip Larkin who reportedly insisted that a tale so autobiographical could not stand for fiction.” Well so much for the Booker. I always seem to prefer the losers anyway. Great Granny Webster knew that I was meant to need sea air, and this suited her very well because apparently she needed it herself. At four o’clock every afternoon a hired Rolls-Royce from a Hove car firm appeared at her door with a uniformed, unctuous chauffeur, who would then drive both of us, as if he was driving two royalties, at a slow creep along the misty sea-front of Hove. To and fro, to and fro, we would drive for exactly an hour while one of the windows of the Rolls-Royce was wound down just enough to let in a very small sniff of salt and seaweed-smelling air. Marooned for several months with her implacable, pessimistic elderly relative, the narrator finds the “grim and fiercely joyless” Great Granny Webster a curiosity–a woman with a “passion for pointless suffering,” and yet in spite of the tedious days of stiff propriety, there’s some undefined bond between the narrator and her great-grandmother. For her part, Great Granny Webster finds that the girl is quiet and “retiring.” While the girl is “chilled” by the frightening thought that she “would turn out to be exactly like her,” nonetheless she feels an inexplicable sense of panic when she finally leaves Great Granny Webster and returns home. Ultimately this stay with Great Granny Webster sparks the narrator’s curiosity about her dead father, Ivor, killed in WWII, and his insane mother (Great Granny Webster’s daughter) safely locked up in an asylum. The narrator learns that her father visited Great Granny Webster frequently when he was on leave, and this, initially seems puzzling since the narrator can’t imagine why her father chose to spend time with his dour grandmother during his all-too-precious leave. Unfortunately “Death had obscured him as a reality,” and the narrator seeks the answers through his history. The narrator’s Aunt Lavinia, Ivor’s sister, is a brilliant, glittering butterfly of a woman who’s worked through several millionaire husbands, and she is perhaps the ‘missing link’–a human antidote to Great Granny Webster. A play-girl in the style of the ‘twenties, she was famous for her beautiful legs and for the fact that she had been married briefly to three millionaires while taking at the same time a large selection of lovers, who were not only friends of her husbands’ but almost as well-endowed financially. Her attitude to life appeared so resolutely frivolous that perversely she could seem to have the seriousness of someone with a driving inner purpose. She believed in having “fun” as if it was a state of grace. Taking nothing seriously except amusement, she caused very little rancor, and although she was considered untrustworthy and wild and was reputed once to have gate-crashed a fashionable London party totally naked except for a sanitary towel, she managed to slip in and out of her many relationships, which she invariably described as “divine,” like an elegant and slippery eel. Could there be two more diametrically opposed people: Aunt Lavinia–who surrounds herself with luxury in a life which is an endless, irresponsible party and a pursuit of pleasure, and her indomitable grandmother, Great Granny Webster, a woman who takes pride in a joyless life of deprivation? Through recollections from Tommy Redcliffe, a family friend, the family tree is completed with memories of Lavinia and Ivor’s parents. Tommy was an old school friend of Ivor’s and an unfortunate visitor to the ramshackle inhospitable eccentricities of the family home, Dunmartin Hall in Ulster. Eventually the layers of memory are peeled back to reveal three generations of bizarre women: the gothic misery of Great Granny Webster, fey, quite mad grandmother Dunmartin who’s sure that the “evil fairies” have stolen her children and replaced them with changelings, and Aunt Lavinia, whose superficial, relentless pursuit of fun and pleasure masks a dark desperation. Not the greatest legacy, then, if you are that next generation. For its incredible depictions of decaying Anglo-Irish aristocracy, Great Granny Webster serves as a wonderful companion piece to J.G. Farrell’s superb novel, Troubles, as the two novels could be describing the same family. Through Tommy Redcliffe’s recollections of his visits to Dunmartin Hall, “a gigantic monument to more prosperous and eternally lost times,” we see eccentricities cross the line into madness. Everyone in the Dunmartin family seems to have entered into a silent conspiracy that life there is ‘normal.’ The “grandiose and unwieldy” mansion comes with “crippling inherited debts,” so every year the house falls into deeper and deeper decay. Having tried to exist by aping an English feudal system most unsuccessfully, it was only the scale of the diminishment of this enormous Ulster house that remained impressive in its period of retribution and impoverishment. Its vast stone-carved swimming pool, surrounded by busts of Roman emperors, still remained somehow imposing, though it rotted in a scum of dead leaves and insects. The same was true of Dunmartin Hall’s once valuable libraries, though many of the pages of their books had become glued together and blued with mildew. Into this damp, rotting house with its leaky roof, rank, inedible food, and practically non-existent plumbing, Grandfather Dunmartin, in an insane effort to maintain standards hires an English butler and footmen. The result of this are horrifyingly, sadly hilarious. And through it all, everyone pretends that daily life isn’t torturous despair. When my grandmother spent most of the day shut up in her bedroom , she sat cross-legged on the floor and cut out coloured pictures of elves and fairies from her enormous collection of children’s books. What everyone found blood-curdling was that she herself had started to look very like the model fairies that you see on the top of Christmas trees. She had the same frozen blank expression, the agelessness that made her seem neither child or woman. Through mordant and perceptive detail, the narrator exposes the deep, dark secrets of the generations that have gone before her. We are left wondering where the madness began, for while one woman is locked up in an asylum, arguably for violence more than anything else, is there anyone normal here–except possibly Ivor who died before he had time to prove his sanity. This deliciously wicked exposition of the grubbier side of the Webster/Dunmartin family argues that we cannot escape our pasts, and that we are more a product of past generations and our upbringing than we’d sometimes care to admit. Yet while our narrator learns about her family, there are many questions left unanswered, and Great Granny Webster manages to have the last word in her farewell to the world. Thanks for the recommendation, Leroy. Glad you liked it Guy. Reading your review I’m struck again by how much she packs into the slim book. I read up a bit on Blackwood after finishing this, an it’s fair to say her own life contains many of the aspects of wildness shading into madness she anatomises with such cold-eyed precision in Great Granny Webster. PS I thought that quote about Lavinia might make it into the review. There were many quotes here I could have included as it’s a very quotable book. I too was curious about Blackwood and did some reading after finishing. Thanks for the recommendation. I can’t imagine anyone not enjoying this book. That last quote about the grandmother resembling Christmas tree fairies is fantastic. It’s rather frightening the way she runs around barefoot, disappearing for hours and hiding behind trees while everyone more or less either ignores her behaviour or pretends it’s normal. Anyway, this comes highly recommended. This sounds excellent. The women are quite eccentric and reminded me a bit of Miss Havisham in Great Expectations. Madness and imagination and all. Excellent review. I like the cover of the book, it shows how family members can come to haunt us. It’s incredible that it partly autobiographical. You would love this Emma. I plan on reading more of this author. This book looks good and I’d neither heard of book nor author before. I’m already seeking a copy. Jonathan: I’d be interested to know what you think. Have you read Troubles, btw? I’ve recently finished this great little book. It’s far too short and, as you mentioned, it’s very quotable. There’s a lot of images that stick in my mind: the stolid GGW sitting impassively in her chair; the mad grandmother ‘away with the fairies’; the decaying, dilapidated Dunmartin Manor; the servants serving re-fried pheasants in wellies; the fun-loving aunt, Lavinia; etc, etc. It’s really quite a simple story, well character studies really, but brilliantly executed. I like the way that Dunmartin Manor is virtually a character in its own right. I haven’t read Troubles but it looks good – I’ve added it to my TBR list. Yes, the matter of the “irish roof” emerges in Castle Rackrent too. As for Troubles, I saw the film first before reading the book and wasn’t sure initially what to make of it–anyway it’s worth catching the film if you can. I’m sure you’ll really enjoy the book. GGW was quite a surprise for me–I didn’t expect it to be so good. “totally naked except for a sanitary towel” – wonderful. I was sold on this before I got to the comparison with Farrell’s Troubles, which if it wasn’t my book of the year when I read it was certainly on my end of year roundup. Fabulous novel, anything that brooks comparison with it is a must read. Beautiful quotes. Just tremendous. Definitely looking forward now to the Corrigan that I have, for which thanks. I’m really looking forward to Corrigan after this. It looks as though she didn’t write a great deal of fiction, which is a shame. The novel really captures the madness of the fading anglo-irish aristocracy–hence the Troubles connection. I know you’ll love this. Guy – I missed this review when you posted it as I was away most of October, but am glad to find it now (thanks to your Castle Rackrent review). Granny Webster is one great character; I much appreciated the understated reference to the fantastic ending as Great Granny Webster having “the final word” (having recently held a similar memorial, I made sure I knew which way the wind was blowing!). I loved this book, and have read all but one of Blackwood’s other novels (which, as you note, are far too few in number). I’ll be curious to read your commentary on Corrigan, when and if you get to it.